The Tandy family began planning their dream residence in advance of their actual return with the help of a long-standing local architect, Theo Matthews, and a respected local native landscaper, Sue Elscott. Adrian Zorzi was suggested to the Tandys by local friends. “After extensive research and review of local building styles, local builder-designers, plus research and discussions with a dozen local builders, we knew our best match was with Adrian,” Nik said. “Adrian showed us around his own Dunsborough home and we were thoroughly impressed with Adrian’s manner, his attention to detail, his use and selection of materials and his thoughtful and accomplished design.” “Adrian’s knowledge of local trades and tradesmen, and particularly his contacts and reputation amongst the materials suppliers that I was negotiating with, cemented his position,” Rachel said. 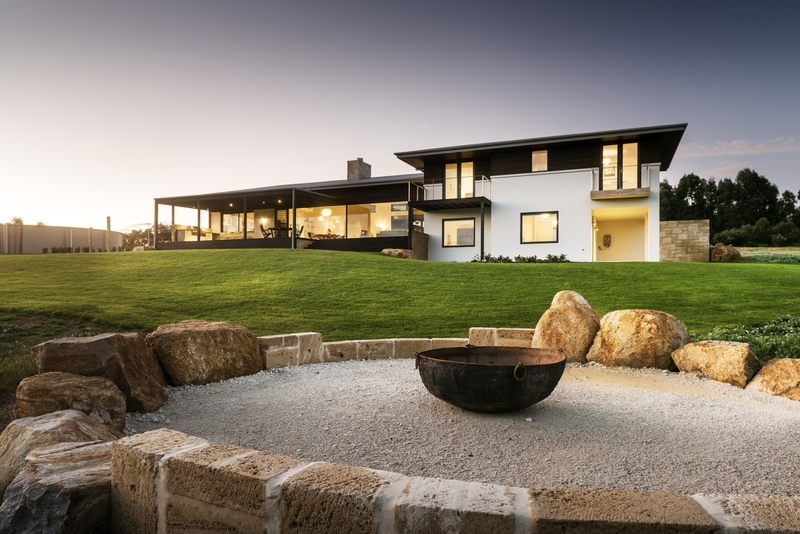 “Adrian Zorzi is set apart by his perfectionist nature, and his consistent performance in Western Australian buildings.” This, together with Adrian’s dedicated focus to single projects, meant the Tandys had confidence. “Unlike other builders and projects that we had seen locally, Adrian wouldn’t let attention drift nor the project slide from excellence,” Nik said. The Tandy’s sought wide, open spaces, areas that would cater to their love of entertaining and a home that would grow with their rapidly developing children. They had strict criteria for the living space, which was to have an open plan and a natural flow, while maintaining a clear delineation between the lounge and dining areas. A carefully planned kids wing was to have a breakout area for play, so that bedrooms were kept just for downtime. A serene parent’s retreat with a separate bedroom and library area for Rachel and Nik makes the most of the view. Architect Theo Matthews completed the building design process largely prior to engagement with Adrian. However, Rachel said she was guided to new ideas for finishes, fixtures and fittings by Adrian. The Tandy’s have recommended Adrian to other friends who have admired their home. “I think that seeing our home speaks volumes of Adrian’s dedication, attention to detail and level of finishing,” Rachel said. “It’s comforting in winter to have all three ovens and fire going and be surrounded by friends, letting all the kids toast marshmallows over the fire whilst the adults chill out,” Nik said.